Many decades ago, when we went to field trips to Laguna, I've heard of this famous buko pie store. I didn't know its name other than it was called Original. I thought it was a bit funny at that time to have the name "D' Original Buko Pie". After all, "D' Original" sounds so 70's! Besides, is it really THE original? I do remember though that even at that time, there was always some sort of a queue at that store. The roadside store I remember a long time ago seemed a bit rustic. Actually, it seemed to me that the whole place then was very rural. It looked like a small barrio (wow, is the word "barrio" even used nowadays? ), with plenty of trees and hardly any establishments or buildings. But that was then. Now that I've driven to Los Banos for Karen's enrollment at UPLB and finding her a boarding house, I realize how the store and the whole place has changed when we dropped by the store to buy their yummy buko pie. And it has a name, "Orient". But people seem to still refer to the store as "D' Original". Now, there's now also a new addition to their line of products, the Buko-Apple Pie (box pictured above) which I particularly liked. Well, the long queues are still there. There has to be a reason why many, including tourists, continue to patronize Orient's Buko Pie in Los Baños, Laguna. Once, while parked there for DH to buy a couple of boxes, I noticed a busload of Koreans waiting for their friends standing patiently in line. I don't claim to be an expert on yummy buko pies, but thus far, I'd say the best buko pies I've tasted thus far are Orient's in Los Baños and the one by Dely's (Dely's House of Pasalubong) in Tagaytay. "X" marks the spot in the map above (click the map to enlarge). It is right across the Anos Memorial Garden shown on the map. From Calamba going to Los Banos, you'll pass by the numerous resorts in Pansol. Along the National Highway after Pansol, you'll see the 88 Korean Resort on the right side of the highway. You'll pass by the Welcome Arch at the Calamba-Los Banos Boundary. You'll pass by the following resorts: Hill Spa Resort on the right, Splash Mountain Resort and Palm Springs resort on the left. 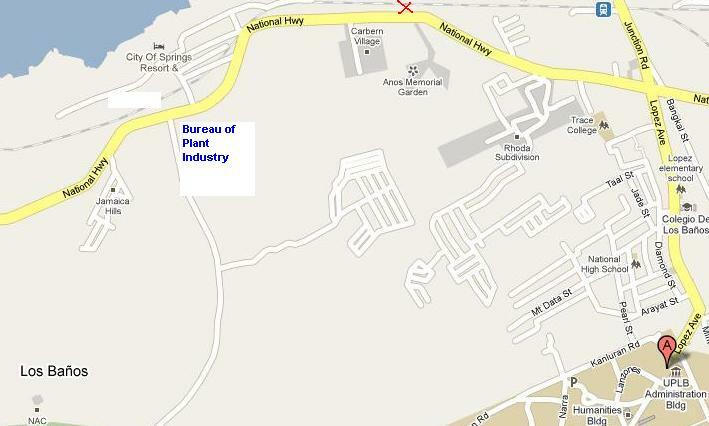 You'll pass by the Boy Scouts of the Philippines Headquarters on the left side and the Bureau of Plant Industry on the right. Slow down a little until you see Heaven's Garden Memorial Park at the right side of the highway. Right across the memorial park/ cemetery is Orient Buko Pie Store. Note, however, that you will miss the Orient Original Buko Pie Bakeshop if you take the shortcut to UP Los Baños. If you're coming from UPLB or downtown Los Banos from the opposite side, slow down immediately once you pass by the small concrete bridge. The Orient Buko Pie Store is on the right.